What's the Best Way to Recover from a Holiday Hangover? Even if you’re not usually a big drinker during the year, the holiday season can do a number on your everything-in-moderation mantra. From open-bar office parties to long weekends with friends to holiday dinners with your family, the holidays offer ample opportunities to binge on booze. But while it’s fun to let loose while celebrating the holiday season, waking up the next day with a splitting headache and general how-did-we-finish-the-whole-bottle malaise is less fun. And the inevitable holiday hangover can keep many from truly making merry. But dealing with a hangover after drinking too much over the holidays is avoidable — if you approach your merriment with the right plan. So take heed and consider these nuggets of wisdom before you raise a glass this season. Dehydration also plays a big role in causing the headaches that come with a hangover. 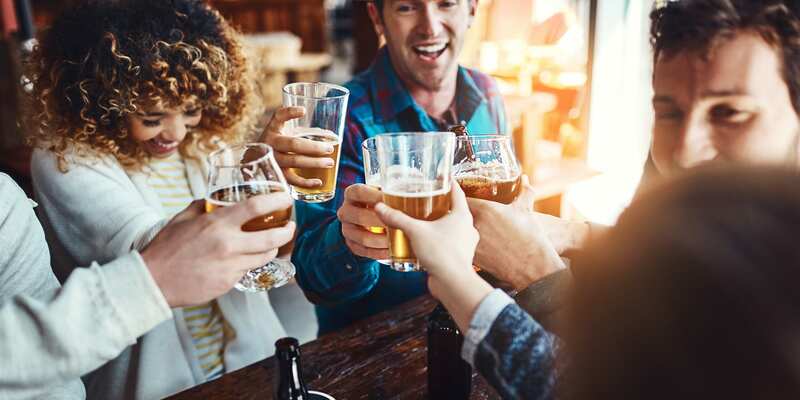 Alcohol is a diuretic — meaning it makes you pee a lot — which is why you may not experience the same pounding headache when you drink something with a high water content, like a beer or a vodka club soda. And, Giancoli adds, alcohol can also negatively affect the immune system (making you feel generally rundown), irritate the lining of the stomach (causing nausea and vomiting), and lower blood sugar (bringing on shakiness and dizziness). The only sure way to prevent a hangover is to avoid alcohol entirely — but if you don’t want to be the buzzkill at the annual holiday hoedown, there are a few things you can do to limit your hangover symptoms. If eschewing alcohol entirely is not an option, the first step is to practice some restraint. “You should limit drinking to about two alcoholic beverages,” says Mitzi Dulan, R.D., C.S.S.D., author and registered dietitian. Pace yourself by spacing out your drinks, like having one during the round of appetizers and then another when you eat dinner. And watch your serving sizes. A single serving of hard liquor, for example, is just 1.5 ounces. Fill a 9-ounce whiskey glass halfway, and you’re effectively doing three shots. Dulan suggests adding sparkling water to your drinks — you’ll help stave off dehydration, and you’ll be less likely to overindulge. Cut Prosecco 50-50 with sparkling water, for example, or mix hard liquor with seltzer and a splash of juice or slice of citrus. “Another way to potentially reduce hangover symptoms,” Giancoli says, “is to drink alcohols that are free or low in congeners.” Congeners are byproducts of fermentation that are considered toxic. They’re higher in darker liquors like bourbon, brandy, and whiskey, and lower in clear alcohol like gin, vodka, and rum. That’s also the reason that mixing liquors can be a recipe for a horrible hangover — the congeners from different types of alcohol can add up, increasing the toxic toll on your body. Can You Stop a Hangover After Drinking Too Much? If you feel yourself getting tipsy as the night rolls on, don’t panic. Just stop drinking and switch to plain water or club soda — or at least start going one-for-one with water. “Drinking a glass of water in between every alcoholic beverage will help cut down on how much you drink, and you’ll continue to hydrate yourself,” Giancoli says. Hitting the refreshment table can help too. “The main thing is not to drink alcohol on an empty stomach, because when alcohol hits the lining of your stomach, it’s immediately absorbed,” Giancoli says. “If you’re drinking on an empty stomach, you’re going to feel the effects of the alcohol sooner.” Food adds a barrier that helps to slow down the speed at which the alcohol gets absorbed into your bloodstream. And healthier grub may be more helpful than junk. “There’s some research that shows things like asparagus and mangoes might be helpful,” Giancoli says. Don’t expect these foods to work any holiday hangover miracles, but as a general rule, hit up healthy snacks like fruits or veggies or whole grains that have antioxidant properties that are good for your body. If you know you’re going to be celebrating hard, plan ahead. Dulan likes to pack high-protein snacks — such as a PB-and-honey sandwich, or protein balls made with oats, honey, peanut butter, protein powder, and almonds — just in case damage control is needed. “These options make you feel better and give you some good energy,” she says. How Can You Recover from a Post-Holiday Party Hangover? Okay, so you celebrated too hard and didn’t realize it until it was too late. Now what? And don’t bother chasing your copious amounts of water with a painkiller before passing out. “Some people take ibuprofen or aspirin before they go to bed as a way to treat the hangover,” says Giancoli. “But that’s not going to last long enough.” By the time you wake up, it will have already worn off. In the morning, Giancoli recommends staying in bed as long as possible. “Go back to sleep. Time is the best healer,” she says. When you finally haul your foggy-brained body out of bed, Giancoli recommends eating a mango or even a persimmon, which studies suggest may help. “They’re not tried and true and they’re not proven,” she says. “But they are certainly healthful and will benefit your body in a variety of other ways.” Mix them into a smoothie, then have a more substantial breakfast — like eggs with whole wheat toast — to get your blood sugar back up and your body feeling ready to tackle the holiday craziness once again.